It’s not that often that I’m organised enough to prepare dinner in advance using the slow cooker but when I do I’m never disappointed. Every time I say to myself ‘I should use it more often’. The meat always turns out tender and the sauces taste so flavoursome. I managed to prepare this recipe whilst my baby was napping and to let it cook through the afternoon, ready for our evening meal. I’m really into North African food at the moment, the ingredients and flavours lend themselves well to a healthy diet. 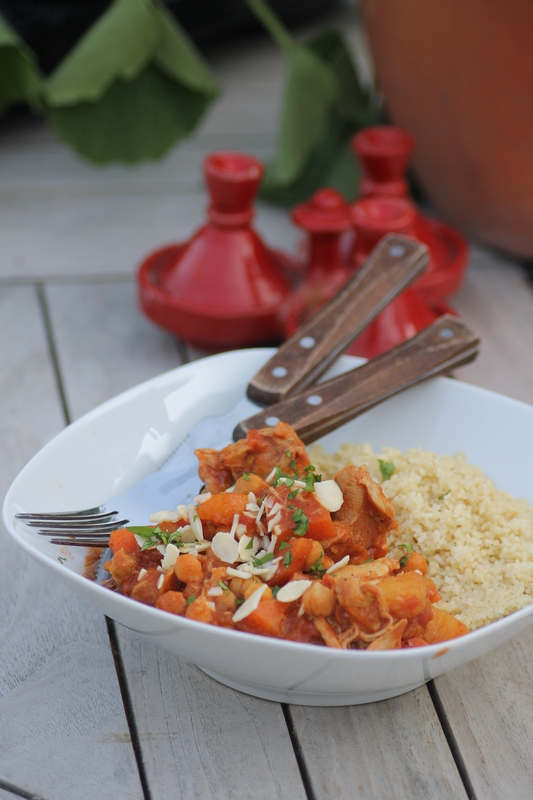 For this recipe I was inspired by a Moroccan style Tagine normally cooked in the dish of the same name but I find it works equaly well in a slow cooker. 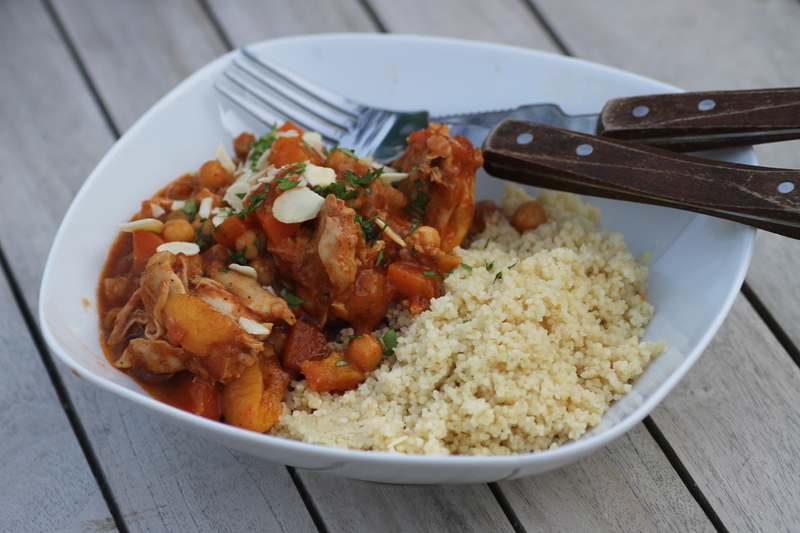 The natural sweetness of the apricot makes this tagine appealing to babies and small children. Using the preserved lemon gives it a mild sweet & sour taste but you can omit this if you are not keen. This recipe would also work well with lamb instead of chicken. Heat olive oil in a frying pan over medium heat. Fry the onions until softened. Add the garlic and ginger and cook for 1 minute. Stir in the flour, tomato paste, agave nectar (or honey if using), and spices and cook for another minute. Add the chicken stock and tomatoes and cook for several minutes. In a large slower cooker add the chickpeas, apricots, chicken thighs, carrots, and lemon (if using) and pour over the tomato/spice mixture from the pan, mixing well. Cover and cook on high for 3-4 hours, or until the meat shreds easily with a fork. Take out and put aside the baby portions before seasoning. For baby, purée coarsely to serve or mash slightly to suit the consistency of food your baby will eat. Season the adult portions with salt and freshly ground black pepper. Serve over couscous, topped with fresh parsley and sliced almonds. Hi Sarah, my little girl was 10 month old when I posted this but I had given it to her a few times before. It all depends on what you have introduced to your little ones already and when you started weaning, they are all different! I would leave out the preserved lemon but apart from that as long as they are ok with tomatoes I’d say try it out and let me know how you get on! We tried this out a few days ago and the girls loved it. So did we. Big thumbs up from all of us! Thanks!